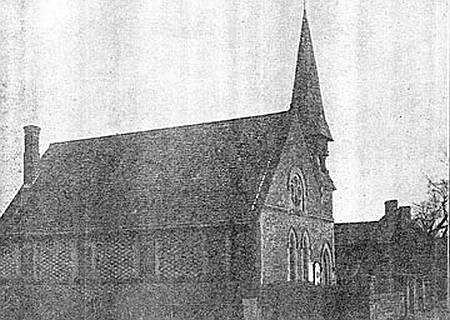 This chapel (closed in 1985 and since demolished) was erected in 1868-9 at a cost of £900 (which included the chapel, chapel houses and land) to a design by W. H. Spaull of Oswestry, to replace a former chapel which had been built in 1855 (which can just be seen in the right of the photograph). The chapel celebrated its first anniversary on Sunday 15th May 1870. The congregation met previously at Gwern-y-brenin in a chapel erected in 1831. In the 1851 Religious Census there were 17 worshippers at their afternoon service and 27 at their evening one, plus 16 Sunday scholars in the afternoon. The congregation published a centenary booklet, 1868-1968, a copy of which is in Shropshire Archives.